The classic hairbrush that takes precedence in every hairstylist’s kit. 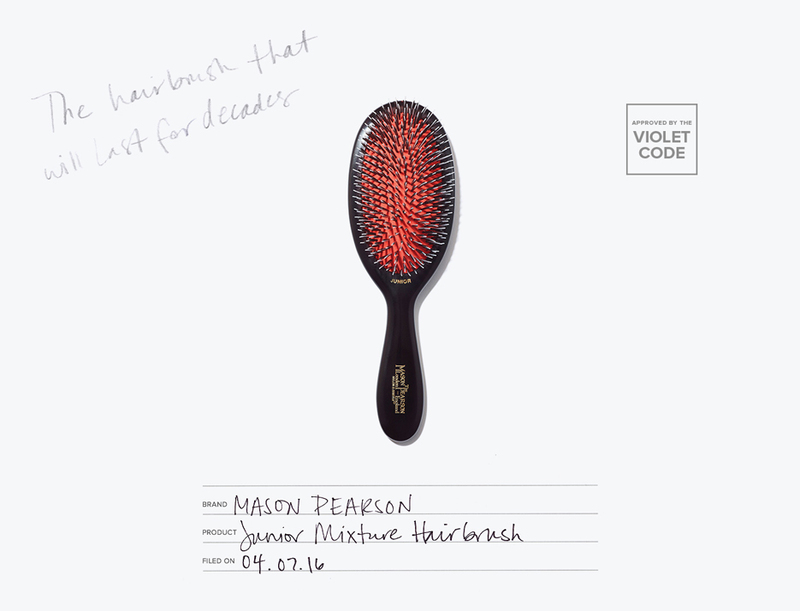 While on set for The Violet Files’ cover shoot with Felicity Jones, hairstylist Alex Polillo raved about the Mason Pearson Junior Mixture Brush. “I can have this particular brush and two other round brushes in my kit and I’m all set,” he says of the petite tool’s versatility and dependibility. Indeed, the sturdy tool has been an industry and vanity staple since its debut in 1885 (that’s more than a century of good-hair-day assistance). Hand-made and assembled in small batches, year after year the boar bristle and nylon tufted brush gently smooths hair (consider it the ultimate companion to any roll set or polished ponytail), prevents split ends (it evenly distributes your natural oils from root to tip), and refluffs yesterday’s blowout. Just ask the Olsen sisters’ hairstylist Mark Townsend, who has been using the same Mason Pearson for more than a decade. Consider it a beauty investment piece. ON SET: A helpful tool for teased hair when a shoot’s creative director demands a 1980s Blondie moment. ON THE RED CARPET: Perfect for brushing out hair after rollers when Veronica Lake–esque waves are in order. ON THE VANITY: Detangles the most stubborn knots before your “woke up like this” selfie.